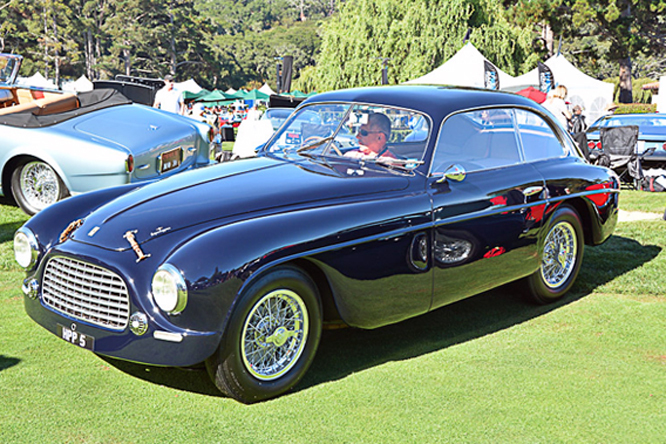 Any one lucky enough to have attended the 1950 Torino Saloon might have stumbled, across todays featured Ferrari 166 Inter chassis #043S fitted with a Touring Berlinetta chassis body. 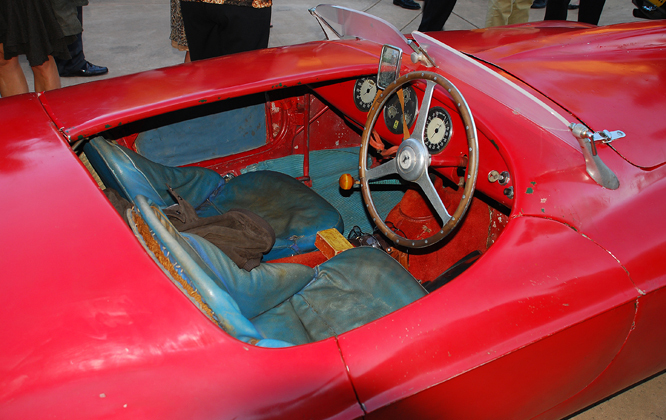 Like the sister 1948 right hand drive chassis #017S I looked at a couple of years ago chassis #043S also went to Milan where a Dr Moretti became the first owner. At some point unknown #043S went to the United States an remained there until 1987 when it migrated to The Netherlands for a couple of years. Brit Danny Donovan had #043S restored at the turn of the century, he changed the colour from red to dark blue and had the car registered HPP 5, a registration currently assigned in the UK to a 1969 Gold Mercedes 280 SL. 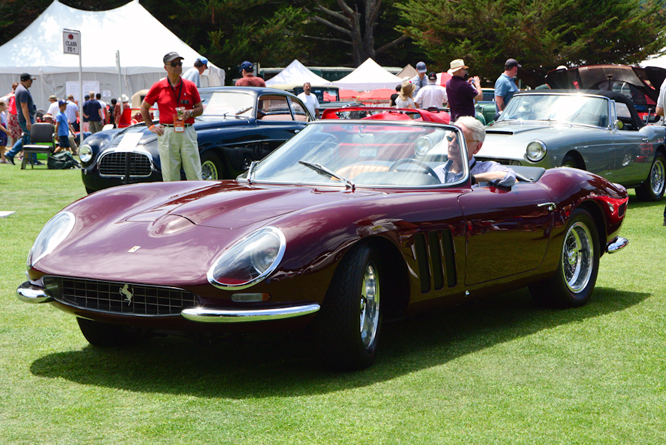 My thanks to Geoffrey Horton for sharing these photographs at The Quail – A Motorsports Gathering a couple of years ago where the car was nominated the Best Closed Car. Thanks for joining me on this “Best Closed Car” edition of “Gettin’ a li’l psycho on tyres”. I hope you will join me again when I’ll be looking at a 24 hour race winning Production Saloon car. Don’t forget to come back now. 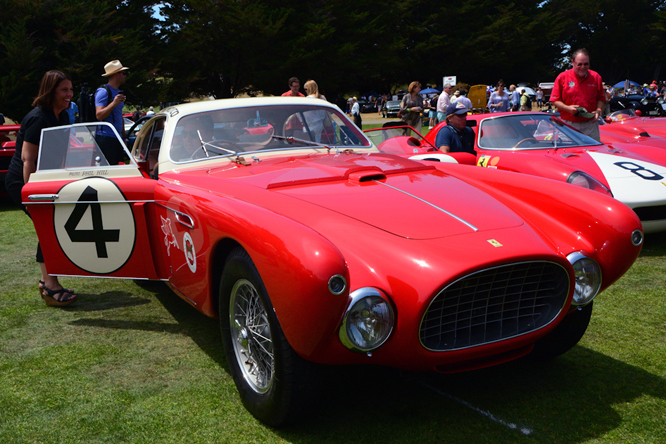 This entry was posted in Uncategorized and tagged 166, A, Berlinetta, Colmar, Coupé, Donovan, Ferrari, Gathering, Geoffrey, Horton, Inter, Moretti, Motorsports, Psychoontyres, Quail, Ralph, Salon, The, Torino, Touring on August 14, 2015 by Ralph. 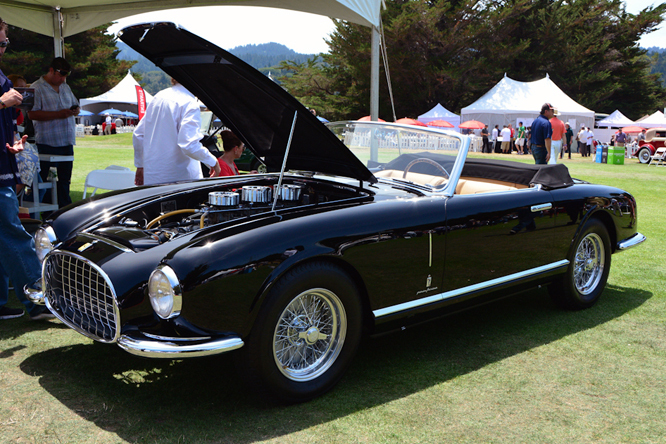 At the Turin Motor Show in 1948 Ferrari presented two new models to the world, the 166 Barchetta sports racer and the 166 Inter Coupé which sits on a longer wheelbase. 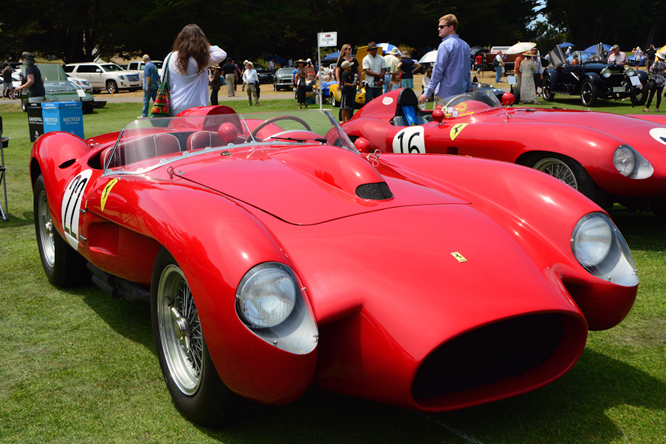 Both vehicles are powered by Gioacchino Colombo designed two litre / 122 cui all aluminium V12’s. 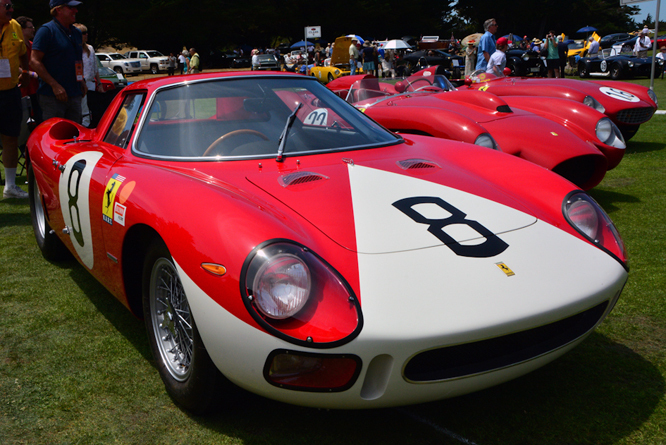 The car seen here carries the chassis number 017S, like all Ferrari’s at the time even numbers were saved for the works team racing cars while odd numbers were designated to cars intended for customers to buy. 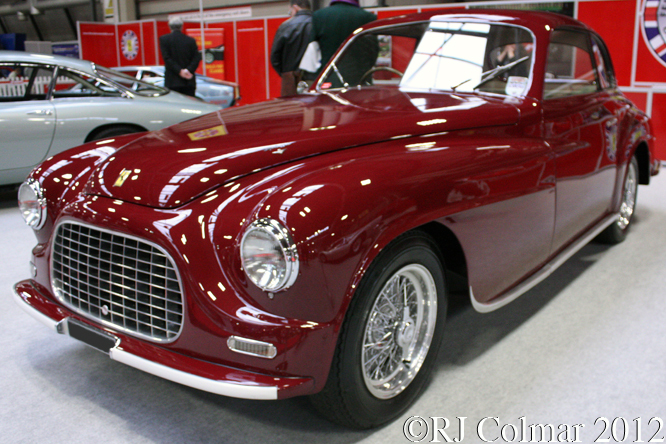 This Right Hand Drive car appears to have been sold new to the Cerana brothers of Milan in 1949 where it remained until 1958 before finding new owners in Switzerland where the car remained until the turn of the Millenium when the car moved to the Nehterlands before finding an owner in the UK in 2009. 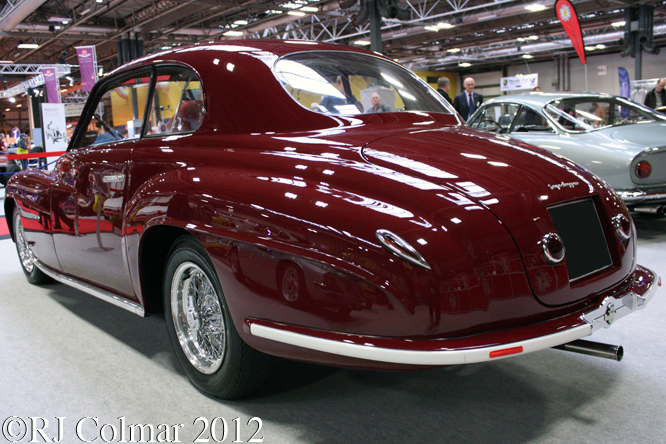 The most popular coachwork supplier for the 166 Inter Coupé appears to have been Touring who built the aluminium body panels for the car seen here with their usual Superleggera structure of tubes in support. 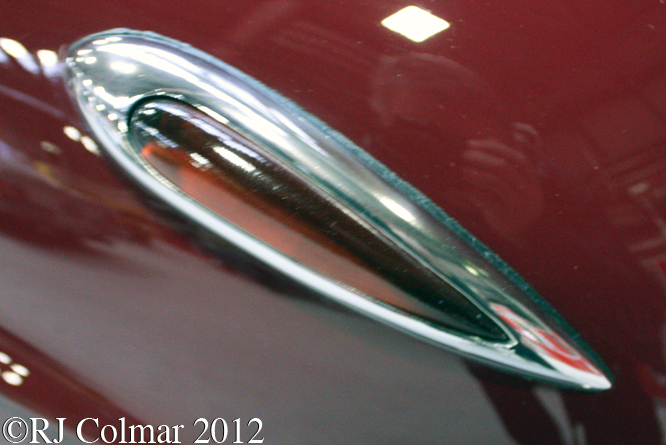 With 110 hp the 166 Inter Coupé could reach a top speed of 105 mph. 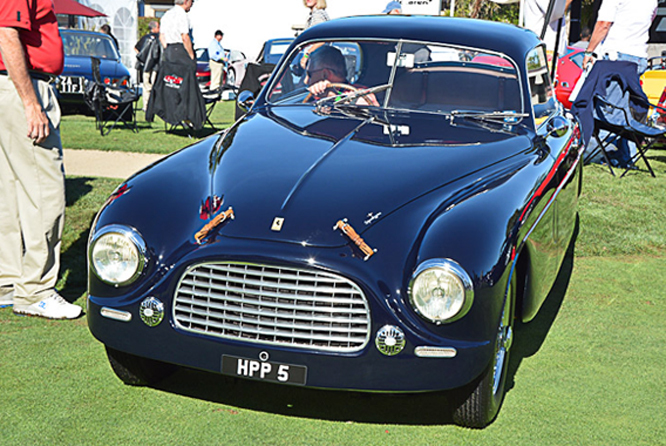 The 166 Inter Coupé represented Ferrari’s first series road cars and in all 37 were built between 1948 and 1951. Thanks for joining me on this “First Ferrari Road Car” edition of “Gettin’ a li’l psycho on tyres” I hope you will join me again tomorrow. Don’t forget to come back now ! 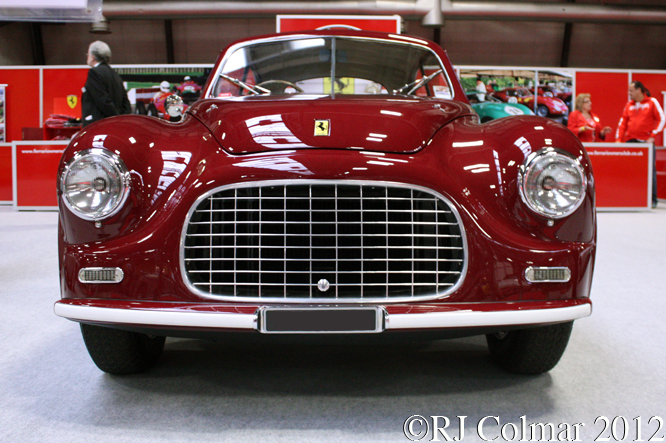 This entry was posted in Uncategorized and tagged 166, Birmingham, Car, Colmar, Colombo, Coupé, Ferrari, GALPOT, Inter, NEC, Ralph, Road, Superleggera, The Classic Motor Show, Touring on January 25, 2013 by Ralph. 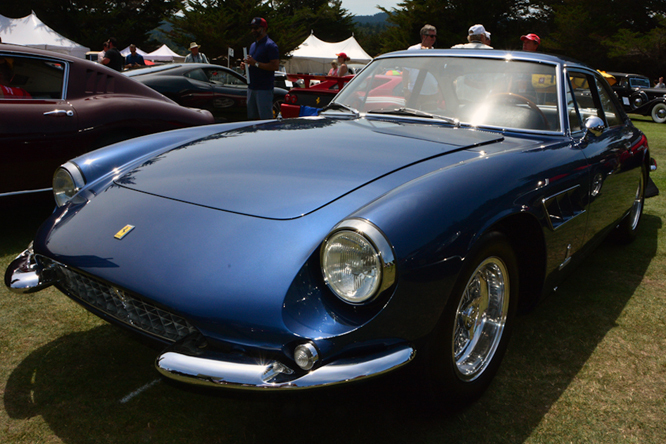 Last week I looked at a FIAT Dino Spider that was part of a programme to homologate (legitimise) Ferrari’s V6 Dino engine, which had impressed many when fitted to the 166 P sportscar in 1965, for the second tier European Formula 2 Championship which mandated 1.6 litre / 97.6 cui motors with a maximum of 6 cylinders based on production blocks of which at least 5000 examples had been cast. 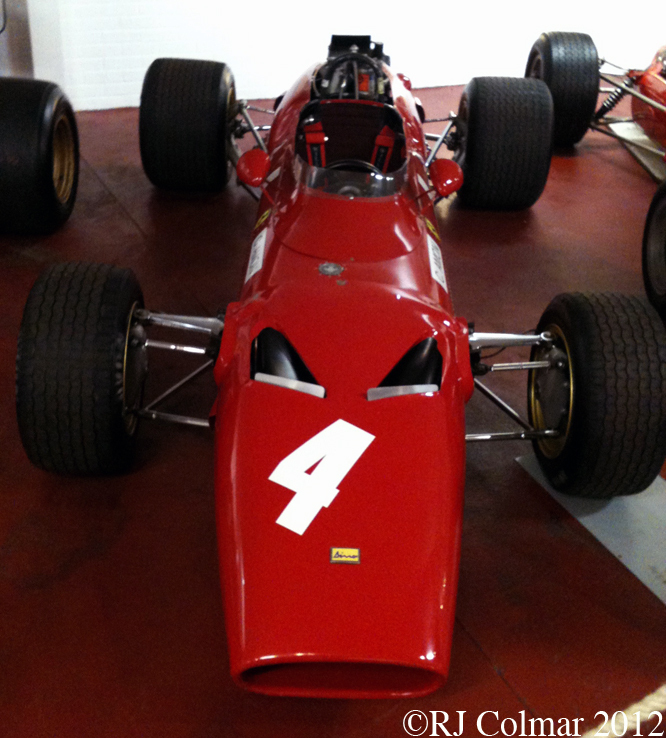 Today’s featured car is the second of seven Ferrari Dino 166’s, that were built to compete in the European Formula 2 Championships from 1967 to 1969. 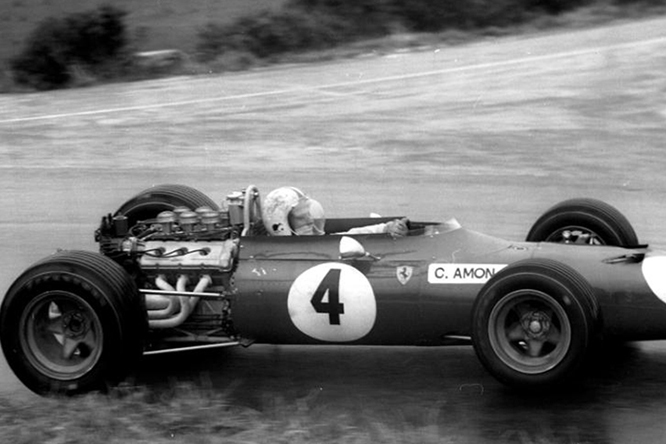 It was first raced in 1967 by Chris Amon at the Hockenheimring in a Formula 2 race in which it did not finish. #0004 was then used by Chris in the Tasman series run in Australia, New Zealand and Tasmania where engines of up to 2.5 litres / 152 cui were mandated. Ferrari sent two motors ‘down under’ one a 2.4 litre / 146 cui V6 with three valves per cylinder and the second with 4 valves per cylinder. Amon won the first two races of the 1968 Tasman series in New Zealand and scored two further second place and two 4th place finishes to be in with a mathematical shot at the championship going into the final round but Jim Clark was not to be denied and Amon finished second to the Scotsman in the final championship standings. Chris is seen in Rod Mackenzie’s photo above driving to a 7th place finish in the last race of the season at Longford, Tasmania. Without doubt this photo represents the furthest point south in a photograph ever published on ‘Gettin’ a li’l psycho on tyres’. Back in Europe #0004 was returned to Formula 2 specification with a longer wheel base and an upgraded 225 hp 1.6 litre / 97.6 cui motor with four valves per cylinder in place of the original F2 spec 3 valves per cylinder. On October 13th 1968 Ernesto “Tino” Brambilla scored a memorable victory, from an 8th place start, at the Hockenheimring by putting all four wheels on the grass as he overtook his team mate Derek Bell and Henri Pescarolo driving a Matra on the last lap. Brambilla’s greatest moment was also Ferrari’s first Formula 2 victory since Wolfgang “Taffy” von Trips class win in the 1960 Italian Grand Prix. Brambilla then drove chassis #0004 to two further consecutive victories at Vallelaguna in Italy and Buenos Aires, Argentina where the #0004 was being used in the South American Temporada F2 series. 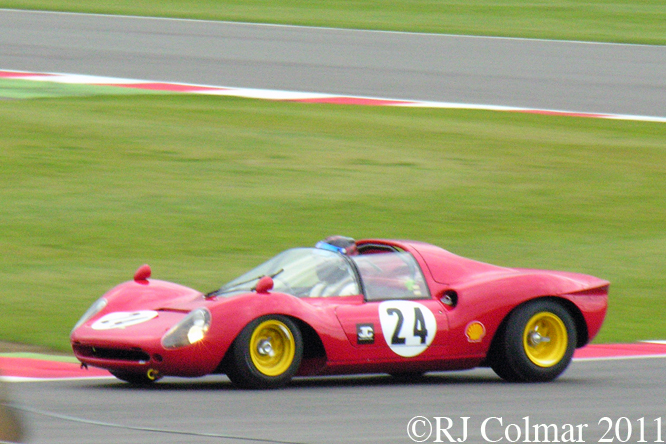 Andrea de Adimich driving another Dino 166 took three victories in the remaining ’68 Temporada Series races to win the Championship while Tino recorded three DNF’s (Did Not Finish). 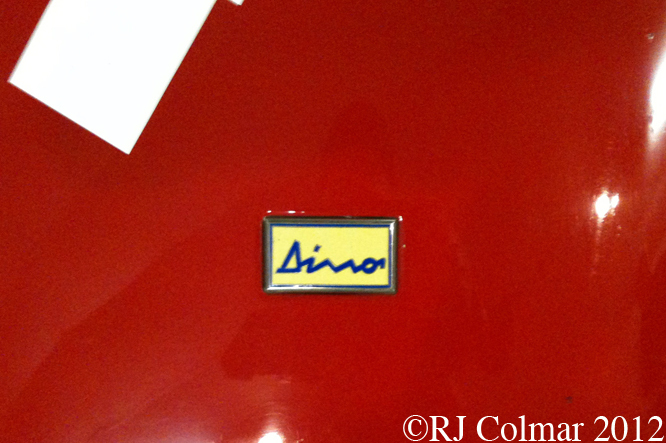 Tino drove the car four more times in Europe in 1969 recording a best 4th place at Jarama in Spain. Chris Amon often considered by everybody except himself to be the unluckiest man in Grand Prix racing went back to compete in the Tasman championship with 166/346 chassis #0008 in 1969. Taking five wins from ten races along with four podium finishes Chris sealed the deal with the Dino at the second time of asking. 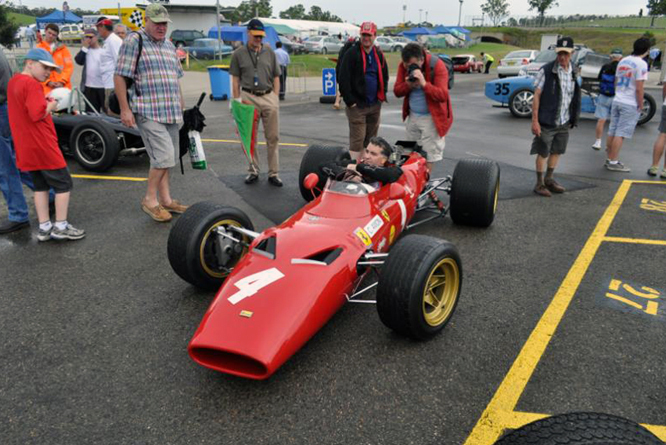 Fellow New Zealander Graeme Lawrence repeated the Tasman Championship winning feat in 1970 using the same #0008 chassis Chris had used the year before. Everett Anton Singer owned #0004 from the mid 1980’s to the late 1990’s during which time the car won it’s class twice in Concours d’Elegance events at Atlanta (’89) and Watkins Glen (’90). #0004, now owned by Graham Adleman has revisited the Antipodes twice since it’s heyday. With Rob Hall drove #0004 to win the 2008 Tasman Revival meeting at Eastern Creek International Raceway just outside Sydney Australia and just getting pipped by a a 3 litre 183 cui Lotus 49 in 2010 Tasman Revival meeting at the same venue. The Tasman Revival will be taking place again this year further details of the event can be found on this link. 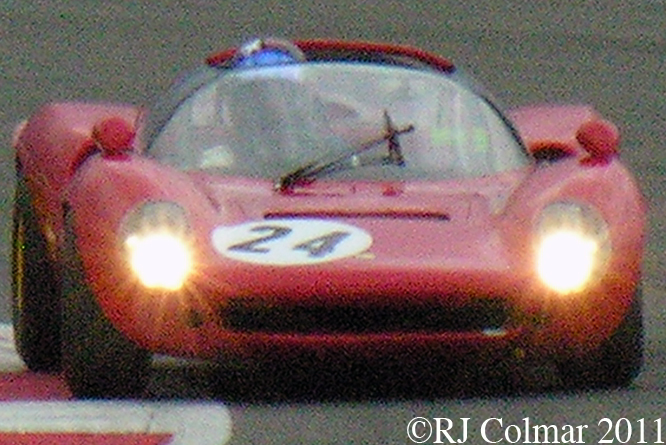 My thanks to Rod Mackenzie for the use of his photographs and to everyone who contributed to the “1968 Ferrari Tipo 166 Dino Formula II” thread at The Nostalgia Forum where more photo’s of #0004 have been posted, particular thanks to Alan Cox for identifying #0004 and ellrosso of the OldRacePhoto.com website which gives viewers a fascinating insight into racing down under over a period spanning several decades. Thanks for joining me on this “Three Continent Veteran” edition of “Gettin a li’l psycho on tyres”, I hope you will join me again tomorrow. Don’t forget to come back now ! This entry was posted in Uncategorized and tagged 166, 2, 246, Amon, Brambilla, Colmar, Creek, Dino, Donington, Eastern, Ferrari, Forghieri, Formula, GALPOT, Hall, International, Longford, MacKenzie, Raceway, Ralph, Tasman, Tasmania, Temporada on July 6, 2012 by Ralph. 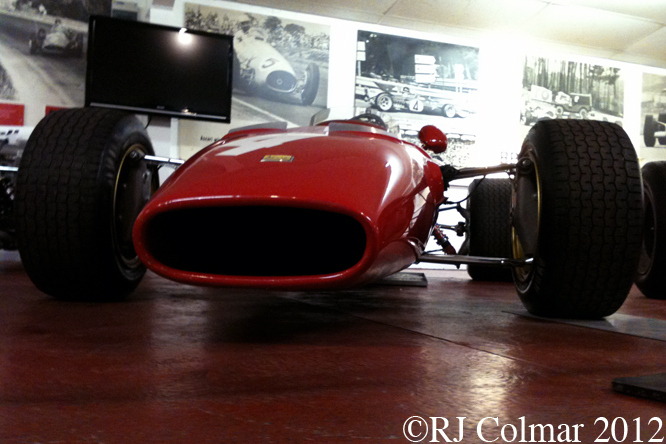 Thanks to more photographs from Geoffrey Horton today we are looking at possibly one of oldest and most original known Ferrari race cars, one which regular eagle eyed reader Racer 187 spotted in my blog last week on the Phil Hill XK120. 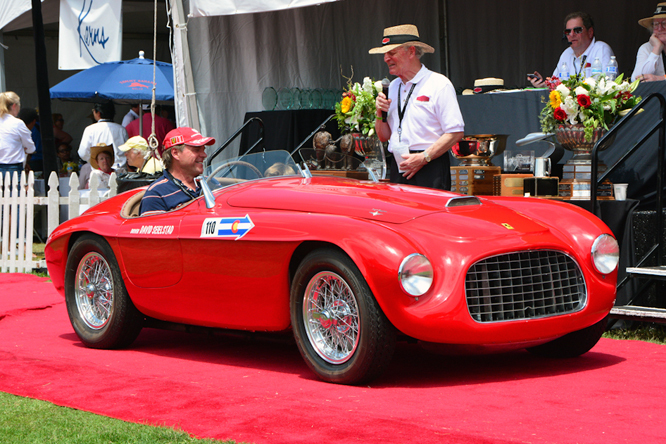 This is a Ferrari 166 MM chassis #0052M shown here at the 2007 Danville Concours d’Elegance some 3 years after it was credited as having been identified by Ferrari Expert Marcel Massini in Arizona in 2004 where, it had been grazing in a barn for forty five years. An unusual right hand drive model this 166 MM appears to have been delivered to Chinetti & Plisson in Paris and originally purchased by the 1949 Le Mans 24 hour winner, who famously won aboard another 166 MM #0008M after driving for just 20 mins, Lord Selsdon. Selsdon, real name Peter Mitchell-Thomson, raced #0052 at Le Mans in 1950 with Jean Lucas, a race from which the car retired after accident damage. The car then was turned over to Luigi Chinetti and Jean Lucas who won the Paris 12 hours race. It came second in the 1950 Daily Express Trophy race at Silverstone driven by Dorino Serafini before Chinetti took the wheel and drove it to some 2 litre class speed records at Monthlery in France. 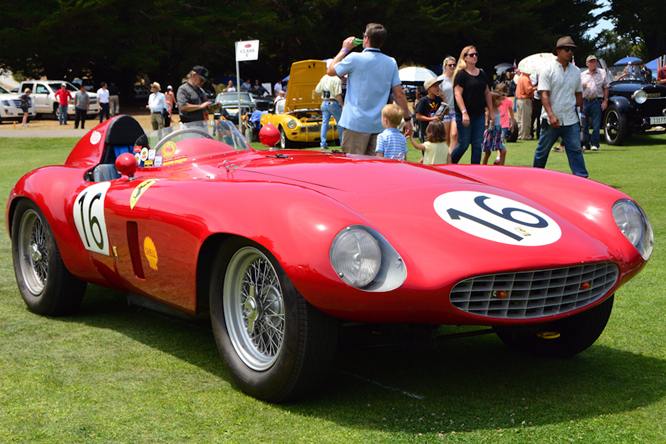 In 1952 owner TASO Mathieson finished 8th in the Targa Florio driving this car and in 1954 the car was fitted with a larger 2.3 litre / 142 cui Colombo V12 from the 195 S model. 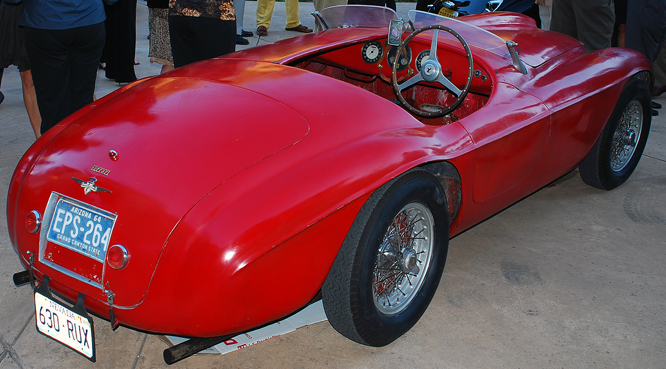 In 1955 the car was converted back to 166MM spec with a 140 hp 2 litre / 121 cui V12 by the factory. 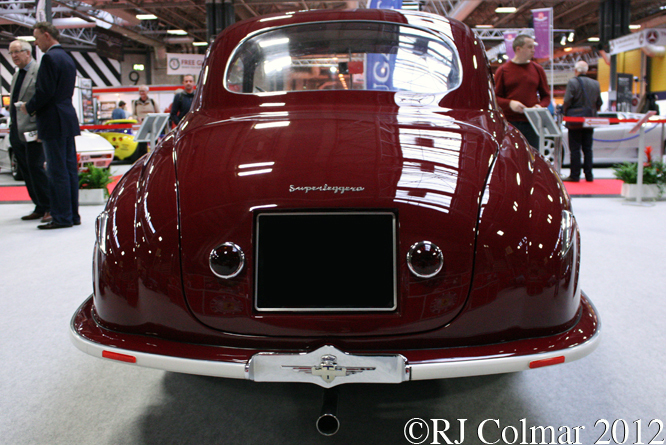 By 1958 this Touring Superleggera bodied car was known to be owned in Switzerland and in 1959 a couple of owners later it was with Chinetti Motors in New York, Chinetti sold it to a Mr RL Litton of Scottsdale, AZ and despite being registered for road use in Arizona in 1964 it apparently was never seen on the road in his hands. 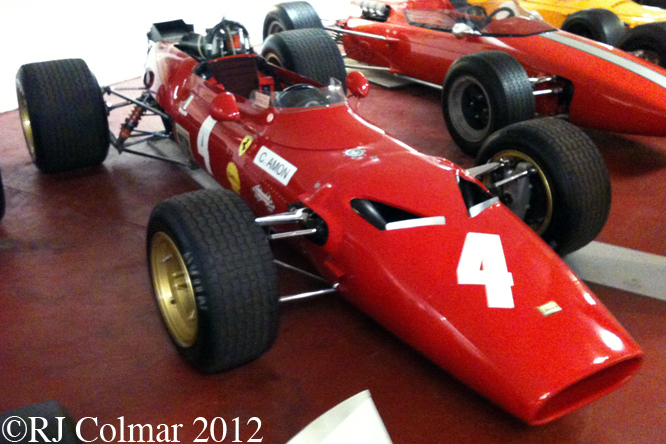 When the car was found in 2004 it transpired that the engine was not an original 166MM type rather a 2 litre V12 more commonly found in a Ferrari Formula 2 open wheel racer, while it is not unusual for Ferrari racers of this period to swap engines, as indeed has been recorded for this vehicle it is still a mystery as to why this car should have an engine common to an open wheel Ferrari. 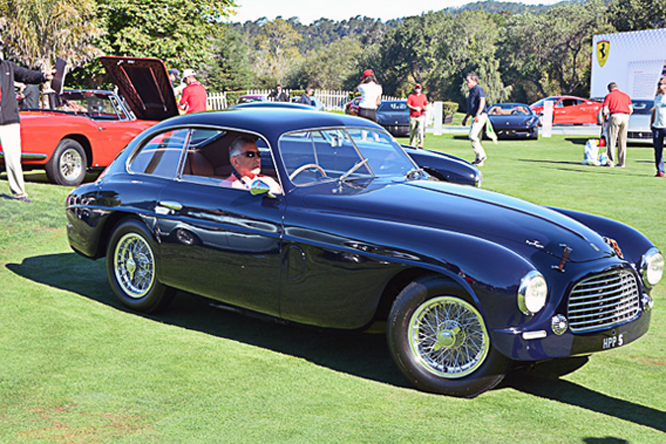 Under the stewardship of Manny del Arroz the car was preserved and returned to working condition and won the Preservation Award at Pebble Beach in 2007. #0052M is last known to have transferred ownership in Germany to Mr J Pawluk of Poland in 2008 for a reputed € 3.5 million, approx £ 3 million or US$ 5 million at todays prices. Readers of my 2009 Rowdy posts might remember the freshly restored 166 MM chassis #0040M Reg YPY 333 belonging to the Mason – Styrrons at Goodwood. This is a clear case where, in my humble opinion, the preserved bucket of rust is worth far more than the restored brand new machine. More photo’s of #0052 M, as it was found by Marcel Massini, in Arizona can be seen on this excellent thread at Ferrari Chat, you will probably have to sign up to see the thread. My thanks to Geoffrey for today’s photo’s, to Michael Platzer for the chassis number and to every one who posted on Marcel Massinis Ferrari Chat thread. Hope you have enjoyed another original patina edition of ‘Gettin’ a lil’ psycho on tyres’ and that you will join me again tomorrow. Don’t forget to come back now ! 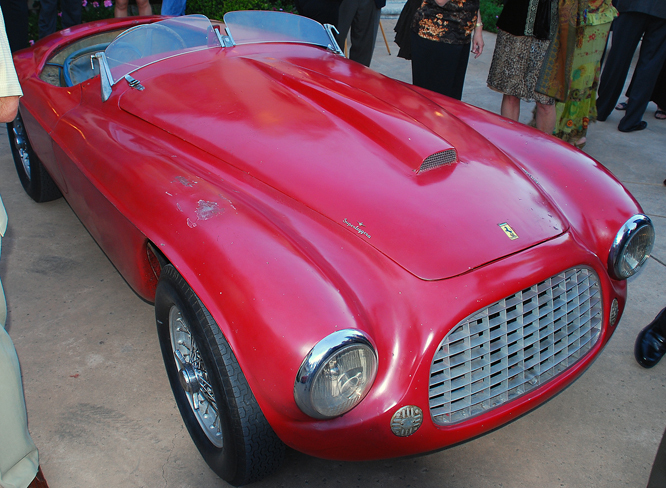 This entry was posted in Uncategorized and tagged 0052M, 166, Art, Chinetti, Danville, Ferrari, FerrariChat, GALPOT, Horton, Lucas, Massini, MM, Rowdy, Selsdon, Superleggera, Tidesco on April 29, 2011 by psychoontyres.